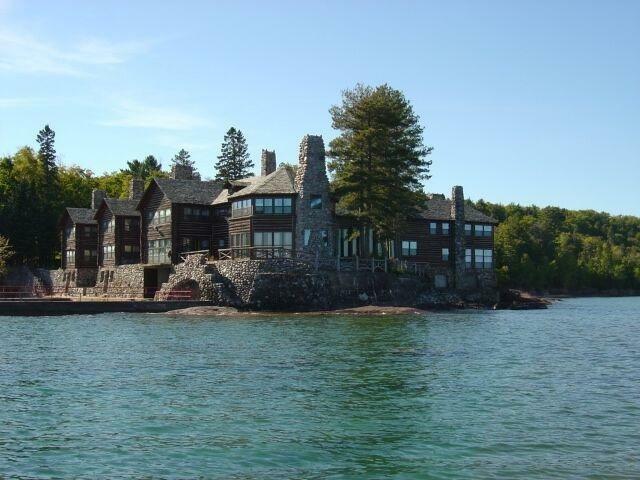 Louis G. Kaufman chose a peninsula jutting into Lake Superior, just north of the city of Marquette, Mich., for his grand “wilderness escape,” hoping to surpass similar “camps” built by uber-rich families of the day like the Vanderbilts, Astors, Guggenheims and Rockefellers. Not only is the main residence reported to be the largest log cabin in the world, but priced at $40 million, “Granot Loma” is also the most expensive home in the entire state of Michigan. And boy, does it have a history. This National Landmark on the shores of Lake Superior consists of a 26,000-square-foot log mansion and a farm to sustain it, on almost eight square miles of land. Construction took four years, completed in 1923, for a grand total of $5 million. That’s the equivalent of about $70 million today, points out Curbed Detroit (the site from which we first learned of the listing). It was built in the days of the great tycoons, by one Louis G. Kaufman, who was not only a financier and bank president, but one of the original guys behind General Motors. 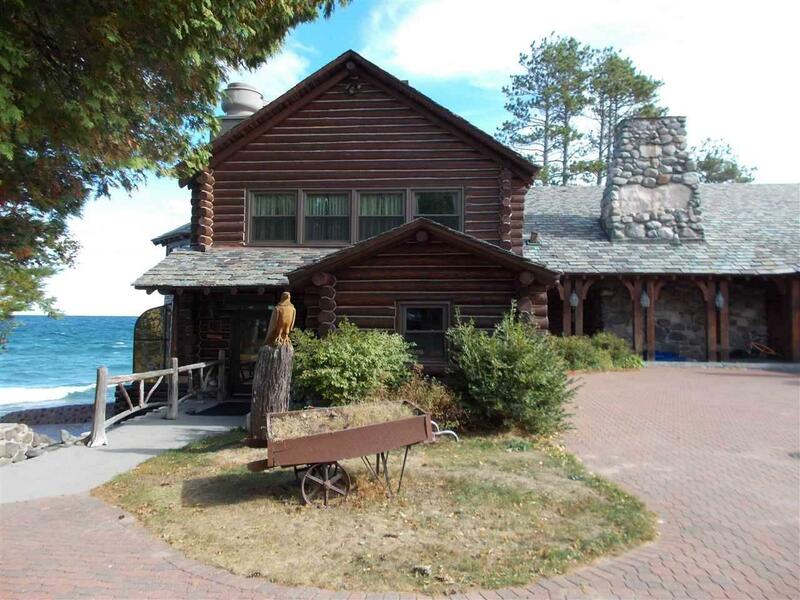 He chose a peninsula jutting into Lake Superior, just north of the city of Marquette, Mich., for his grand “wilderness escape,” hoping to surpass similar “camps” built by uber-rich families of the day like the Vanderbilts, Astors, Guggenheims and Rockefellers. Kaufman employed 22 architects to design and assemble the pine logs, which were wrapped in burlap and shipped by train from Oregon, then erected around a steel frame embedded in a 6-foot-thick cement foundation, to protect the structure from Lake Superior. Although it was meant to be used in summer, it was built to sustain the harsh winters in the great North Country. The estate’s title, Granot Loma, is an odd mishmash of letters from the names of Kaufman’s first three children, Louis, Graveraet and Otto, and his wife Marie’s name. Hey—when you have that kind of wealth, who’s going to criticize you? The 23-bedroom, 13-bath estate contains such one-of-a-kind and irreplaceable features as murals and paintings and even doorknobs hand-embellished with Indian/Western scenes by Academy Award-winning designer Orry Kelly. In the main lodge, a 60-foot-long great room has a chandelier made from the root system of a white pine; Kaufman played under it as a child. The light fixture is adorned with carvings of more than 50 animals, insects and people. That great room also has a 30-foot long fireplace with a mantel made of a wooden beam salvaged from a sunken ship found in Lake Superior. Marie Kaufman personally selected those fireplace stones from a rowboat, instructing divers to retrieve them. It’s one of 26 fireplaces on the property. Obviously some updates have been made. Chicago bond trader Tom Baldwin purchased Granot Loma in 1987, with the intent of restoring the lodge to its former glory and adding some touches of his own while updating the place for modern life. He added a kitchen that is supposed to be a replica of the one in the White House, and a glass atrium overlooking Lake Superior that was installed as a breakfast nook. Also, a 3,000-gallon custom Jacuzzi was added to take advantage of the southern view of Lake Superior while you soak. It’s Baldwin, the current owner, who is attempting to sell Granot Loma for $40 million. But there’s far more to Granot Loma than the main lodge we’ve just described. The property also includes numerous other buildings, such as a guest house with four apartments, maid’s quarters, a playhouse, a root cellar, garages, and a tennis court designed by tennis champ of yore Bill Tilden. Then there’s the farm. It includes 13 buildings set on a hillside, fields, an orchard, two homes, a barn, a pool with a pool house, a massive dairy barn, garages and sheds. And just so you don’t forget the place has a history, vintage farm implements are carefully arranged around the farmyard. If the farm and the lodge aren’t enough to keep you busy, a trail system includes 3.7 miles of Lake Superior shoreline. There’s hunting on the property if you’re into that sort of thing, and fishing for trout and salmon, amid 5,000 acres of timberland. If you’re into water sports, there’s a private marina from which you can indulge in boating, jet skiing, parasailing, you name it. Although it’s said that Muhammad Ali visited Granot Loma in the 1970s and attempted to buy it for a boxing camp, and President Gerald Ford was once interested in making it his Western White House, something tells us this property will not be an easy sell. Of course it has some sublime features and a priceless history, but its remote location – some distance from Detroit, its nearest big city – could deter some buyers. 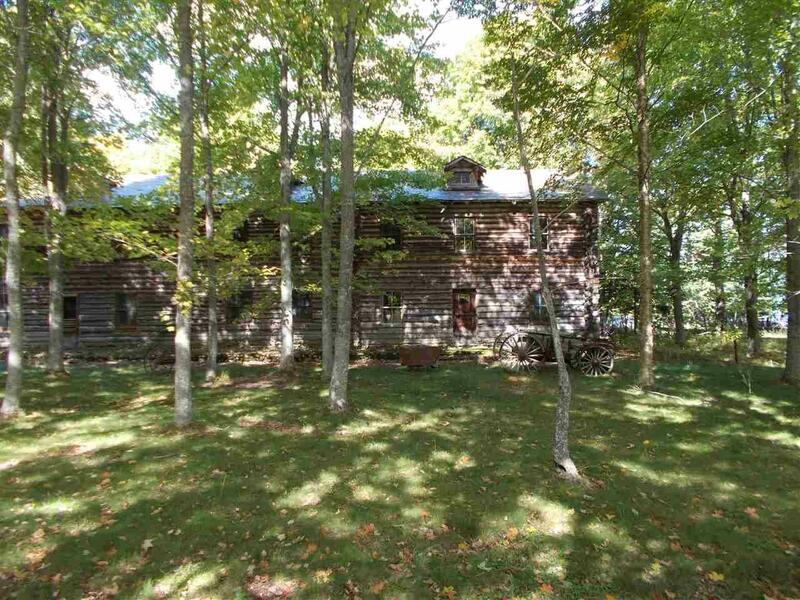 And the nature of the estate itself could turn away a few others who might have been interested in it for private use. To us, it seems to be waiting for a resort to happen. In fact, Louis Kaufman built Granot Loma as the result of being snubbed by the snooty Huron Mountain Club, according to the property’s official website. Back in the day, many of the most upscale clubs denied people membership no matter how wealthy they were, because of ethnicity or religious belief. Kaufman was apparently the son of a Jewish immigrant, and perhaps was of Indian descent as well.